Increasingly people are chronicling their experiences with life-limiting illness online. They help us understand a phase of life that many find hard to face, making a tough subject slightly less taboo. If fact only last week, Charlotte Kitley, a blogger with Huffington Post UK, posted a blog posthumously And So There Must Come an End. There are other examples, like Doug Gosling and his amazing writings in his blog Dying Digitally or Kate Granger (@GrangerKate), a palliative care doctor & terminally ill cancer patient musing about life and death. Often through sharing online, people build communities and we get updates from people who are connected to them in person. But sometimes. there’s just silence. 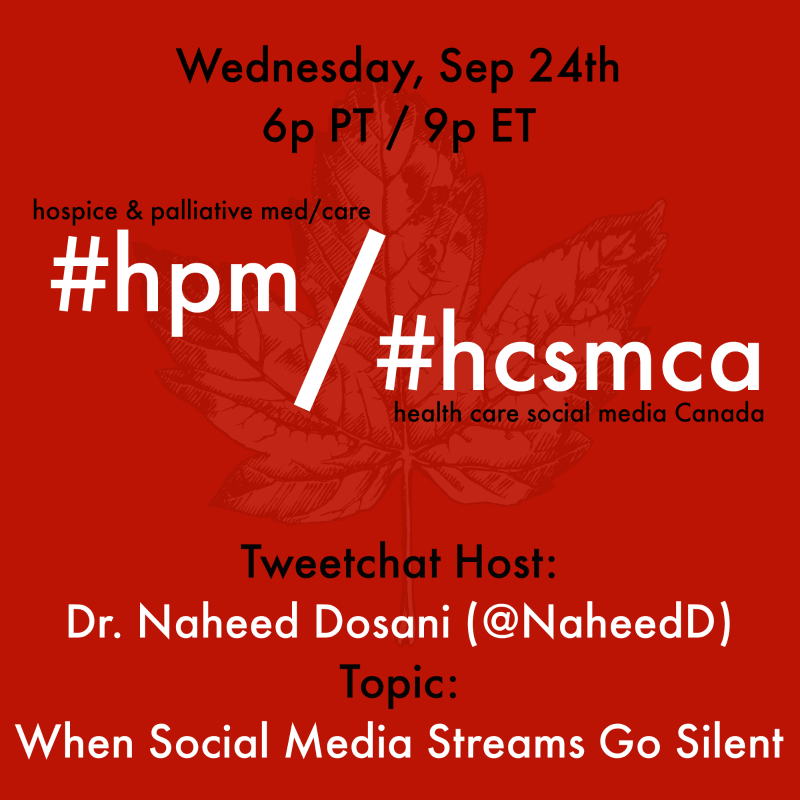 In our next Tweetchat we'll bring together the Twitter communities of #hpm (hospice and palliative medicine/care) and #hcsmca (health care social media Canada) to discuss some of the issues that emerge from the generous contributions of these authors. Some of the questions to be covered may include: What happens when their social media channels go silent? Are they truly gone? Are they just too ill to write? Do the people close to them take over the communication? How does a writer's openness about their illness and mortality differ from classic illness support/update blogs? What obligations are unexpectedly thrust upon them because of a growing audience? What blogs/vlogs from people with a serious illness have influenced and/or inspired you? Join us with our host Dr. Naheed Dosani (@NaheedD), Wednesday night (September 24th) at 9p ET. We'll be using the hashtags #hpm and #hcsmca and meeting new friends as we bring these two communities together.